Trisha over at Crunchy Catholic Momma has a Thursday Stash Bash. So I decided to use this as an opportunity to jump start some of the hundreds of projects I have accumulated over the past 10 years or so. Before I went back to work and then graduate school I sewed and embroidered all the time. Gifts for others, stockings for nieces, samplers for all the kids in our families. I started some quilting and fell in love with flannel rag quilts, making them for my boys and my husband. I even won an honorable mention at the State Fair of Texas for one piece of needlework. But life got in the way and I put everything up for a while. The good thing about accumulating a large stash of projects is that even if I never had another penny to spend on anything else, I would have plenty of needlework projects. I’ve been so busy that I have a new sewing machine that I have had for over a year that I have not even threaded; my 20+ year old Kenmore having finally bitten the dust. It didn’t help that I hadn’t had it serviced and oiled for years. 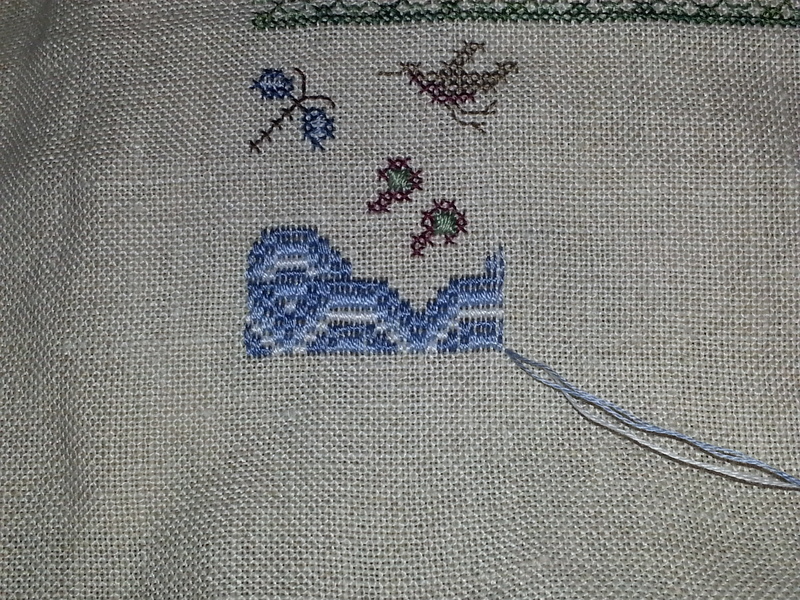 I’m doing this sampler for our 20th wedding anniversary which is a year from this November. I started it a couple of years ago, knowing it would take me a few years because I have so many projects, plus I want to enter it in the State Fair and I can’t do that until the summer before my 20th anniversary at the earliest. So, the first thing I noticed is that the blue and white bargello border I was working on had been worked in one thread but the pattern called for two threads. So I had to take out that portion and start over. 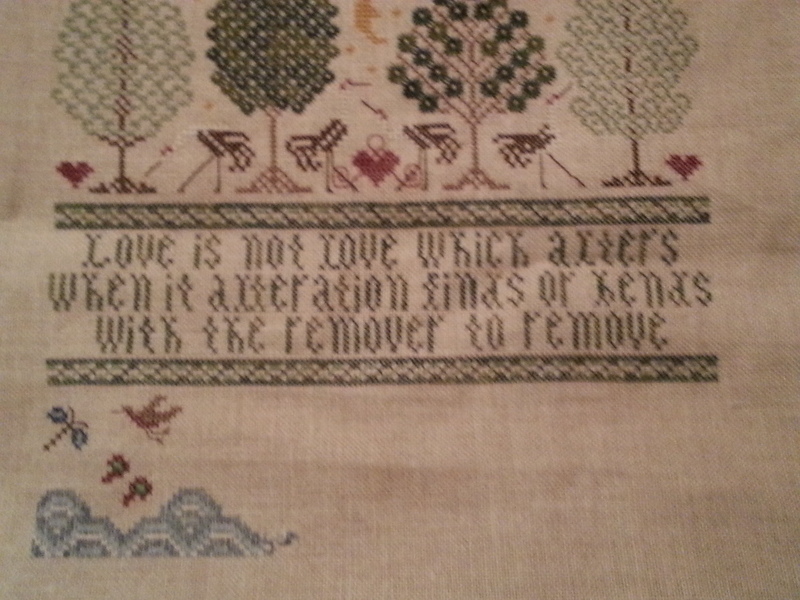 Long ago I learned that you’re not a good needleworker if you don’t take out as many stitches as you put in. 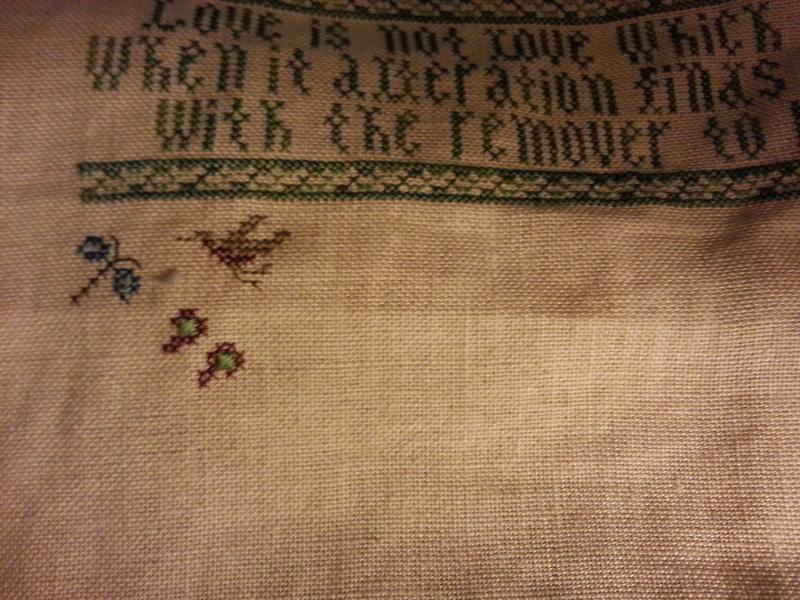 So, it took about 30 minutes to cut the stitches out and about 1-1/2 hours to restitch that section. Doesn’t it look better with the two threads?